Info Lud Kramer was born into a wealthy New York family on June 10, 1932. After graduating from Brooks Academy in Andover, Massachusetts, he joined the Air Force, serving as a sergeant for four years. He moved to Tacoma in 1955 after completing his military service, and began a career in banking. There he met and married his wife Patricia, with whom he had four children. The Kramers moved to Seattle, and in 1961, at age 29, Lud Kramer was elected to the Seattle City Council. On the council, Kramer supported efforts by fellow council member Wing Luke to enact an open housing law banning racial discrimination in housing. Voters rejected their efforts in a March 1964, referendum, but an open housing law was subsequently passed in 1968. 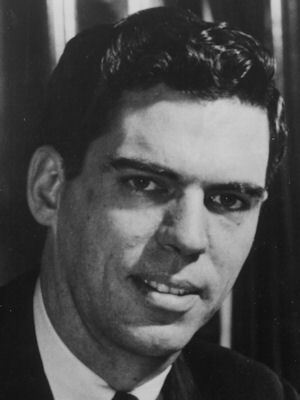 In 1964, Kramer won the Republican nomination to challenge incumbent Secretary of State Vic Meyers (1898-1991), the former bandleader who had served five terms as Lieutenant Governor and two as Secretary of State. Kramer campaigned alongside Senate President Dan Evans (b. 1925), a fellow moderate Republican who was challenging two-term governor Albert D. Rosellini (b. 1910). The two young progressives ousted the Democratic incumbents, overcoming what was otherwise a Democratic landslide -- President Lyndon B. Johnson (1908-1973) and Senator Henry M. "Scoop" Jackson (1912-1983) won by huge margins and Democrats took every other statewide office. "He had such a big heart. If he found something that upset him, he'd say, "We'll take care of that" (Kaiman). Kramer traveled to migrant farmworker camps and volatile urban neighborhoods to hear residents' grievances. He registered Hispanic voters in the Yakima Valley and played a key role in getting the Legislature to improve housing standards for migrant workers. In Seattle's Central Area following the assassination of Martin Luther King Jr. (1929-1968), Kramer acknowledged the need for change, appealed for calm, and listed efforts the state was making. In 1969, Kramer chaired the Washington State Commission on the Cause and Prevention of Civil Disorder. The Kramer Commission, as it became known, issued a 63-page report documenting the housing discrimination and disparate treatment of African Americans in the criminal justice system that created the potential for unrest in Washington cities. Kramer pushed for fair housing laws and prison reform legislation. He also worked to reform election laws. Kramer advocated reform legislation that led to formation of the Public Disclosure Commission, which monitors campaign contributions, and he supported lowering the voting age from 21 to 18. Early in 1974, Kramer took a temporary leave from his position as Secretary of State to help lead a controversial $2 million food giveaway to the poor in California, which was organized by the family of kidnapped heiress Patty Hearst in response to demands from her kidnappers. That same year, Kramer ran for the open U.S. House of Representatives seat from the Third District in Southwest Washington, but lost the race to Democrat Don Bonker (b. 1937). Following the Congressional race, Kramer resigned as Secretary of State on January 15, 1975. Kramer and his family established the Ludlow Foundation to give small grants to needy individuals and nonprofit organizations that are not funded by large foundations. He also pursued business ventures in Washington, Alaska, and Montana. Lud and Patricia Kramer moved to the Spokane suburb of Liberty Lake in 1995. Kramer became a leader in the effort to incorporate Liberty Lake and worked to develop parks, trails, and a library in the new city.